Theatre Within today announces the November 15th release of a live album chronicling the sold out, star-studded 30th Annual John Lennon Tribute, Live from the Beacon Theatre NYC. The 15-song release will be available digitally via iTunes, Amazon and other major online music outlets. The album can be pre-ordered now at: http://itunes.apple.com/us/preorder/the-30th-annual-john-lennon/id475506130. Proceeds from the sales of the digital release will be shared with the Japanese Red Cross for its ongoing Earthquake/Tsunami Relief efforts. “John would have loved that Theatre Within has produced a special live album of his songs to benefit the Japanese Red Cross and the people still suffering from the tsunami and earthquake,” states Yoko Ono. 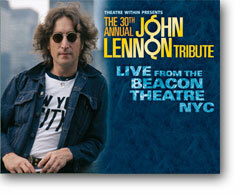 The 30th Annual Tribute took place November 12, 2010 at New York‘s legendary Beacon Theatre and featured an all-star line-up of musicians, spanning nearly four generations, each performing unique interpretations of classic Lennon songs, from his Beatles through solo years. Theatre Within, a not-for-profit performing arts presenter dedicated to producing shows to benefit important charities and social causes, has produced The Annual John Lennon Tribute since 1981, shortly after Lennon’s death. It is the longest running event of its kind and the only ongoing tribute show in the world to have earned the support of Yoko Ono. Theatre Within also announces that its 31st Annual John Lennon Tribute will take place on Saturday, December 10, 2011, at Le Poisson Rouge. This year’s lineup includes: Tribute alumni Steve Forbert, Bettye LaVette, Lucy Kaplansky, Rich Pagano,Richard Barone and first timers, Toshi Reagon and Ari Hest.